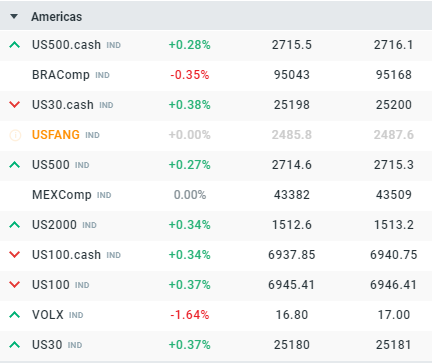 It’s been a fairly positive start to the new week for US indices, with all 4 markets trading higher ahead of the cash session. Thursday and Friday’s trade followed a similar pattern for US stocks, with selling ceasing around the European close and a recovery into the end of the Wall Street session. The recovery on Friday saw the US500 end both the day and the week slightly higher, and the move has since gained further support after some positive remarks on the trade front as China return to the markets following their New Years holiday. As we noted earlier, confirmation that Chinese Vice Premier Liu He confirmed over the weekend that he would join trade talks scheduled to take place in Beijing on February 14-15. The event will also host US Treasury Secretary Steven Mnuchin and US Trade Representative Robert Lighthizer. Since then there’s been more positive comments on this front with Fox News running a story that quotes White House adviser Conway, saying that it looks like the US and China are getting closer to a trade deal. Conway also said that it’s possible Trump and Xi will meet very soon. There’s nothing concrete here to suggest a breakthrough but the tone of news flow ahs clearly improved of late and this is providing support for stocks for now. While the news on the trade front has been upbeat, the global economy is showing more signs of slowing and Nobel-winning economist, Paul Krugman has warned that he sees a good chance of a recession hitting the US within a year. Speaking in Dubai, Krugman made the comments and said that the limited ability of the Fed and ECB to alter policy in response to a downturn could exacerbate the problem, if a downturn hits Europe and Asia and spreads to the US. In a separate interview, the comments were clarified by Krugman saying that he saw even odds of a recession. “The euro area is clearly experiencing a slowdown pretty close to recessionary levels already and has no recourse. Draghi can’t cut rates because they’re negative already ...so I think Europe is a danger spot that is potentially as big as China,” said the economist, referring to the ECB’s President Mario Draghi and that central bank’s stimulus measures rolled out to address the 2007-’09 financial crisis.